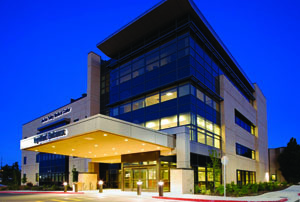 Jordan Valley Medical Center was founded in 1983 to meet the needs of a growing population in the southwest part of the Salt Lake Valley that began in the early 1980s. Today, Jordan Valley has 50 licensed beds and averages more than 3,500 inpatient admissions annually. The hospital prides itself in emergency medical care and last year, had more than 27,000 emergency department visits. The hospital specializes in family-centered maternity care, industrial medicine, community health education and comprehensive women's services. JVMC has a new 23 bed Emergency Department that includes two cardiac/trauma beds, eight fast-track beds, two women's health beds, and one ENT bed. It is staffed 24 hours a day by a team of quality physicians, nurses, and technicians and they have also expanded our Radiology, Surgery and Laboratory as well as the Cafeteria and Admitting. JVMC is located at 3580 West 9000 South West Jordan, UT 84088 in the Salt Lake valley. To visit their website click here.